Three minor-ish trades went down on Friday night. The Mets acquired A.J. Ramos from the Marlins for Merandy Gonzalez and Ricardo Cespedes; the Nationals acquired Howie Kendrick from the Phillies for McKenzie Mills; the Orioles acquired Jeremy Hellickson from the Phillies for Garrett Cleavinger and Hyun Soo Kim. Below are the projections for the prospects who changed hands. WAR figures account for the player’s first six major-league seasons. KATOH denotes the stats-only version of the projection system, while KATOH+ denotes the methodology that includes a player’s prospect rankings. 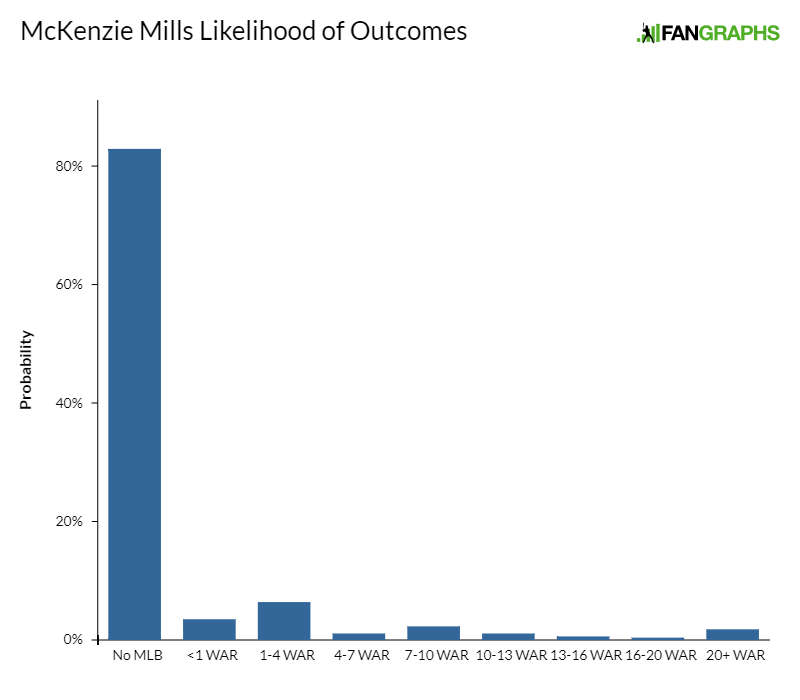 None of the players dealt last night are top prospects, and as a result, their likelihood of outcomes graphs are heavily skewed towards “no MLB”. Kyle Glaser recently found that fewer than one in five prospects traded at the deadline contribute more than one positive WAR season. All three of these pitchers seem like good bets to fall into that bottom four-fifths. Gonzalez has pitched well this year, spinning a 1.78 ERA across two levels of A-Ball. His peripherals suggest he hasn’t been quite that good, however. In particular, his 21% strikeout rate leaves something to be desired. Furthermore, Gonzalez is only 6-foot-even, and as a 21-year-old Dominican signee, he’s a bit old for A-Ball. To put some faces to Gonzalez’s statistical profile, let’s generate some statistical comps. I calculated a Mahalanobis distance between Gonzalez’s A-Ball performance and every A-Ball season since 1991. In the table below, you’ll find the 10 most similar seasons, ranked from most to least similar. The WAR totals refer to each player’s first six seasons in the major leagues. Please note that the Mahalanobis analysis is separate from KATOH. KATOH relies on macro-level trends, rather than comps. The fates of a few statistically similar players shouldn’t be used to draw sweeping conclusions about a prospect’s future. For this reason, I recommend using a player’s KATOH forecast to assess his future potential. The comps give us some interesting names that sometimes feel spot-on, but they’re mostly just there for fun. Mills has pitched well in Low-A this year, posting a 3.01 ERA and a 28% strikeout rate. However, he’s had a bit of a homer problem — he’s allowed 12 in his 18 games started. And as a high school draftee who turns 22 in November, he’s quite only for Low-A. The Orioles drafted Cleavinger in 2015’s third round after a dominant college career in Oregon’s bullpen. He’s been less dominant as a professional, however, especially as he’s gotten further from the lowest rungs of the minors. 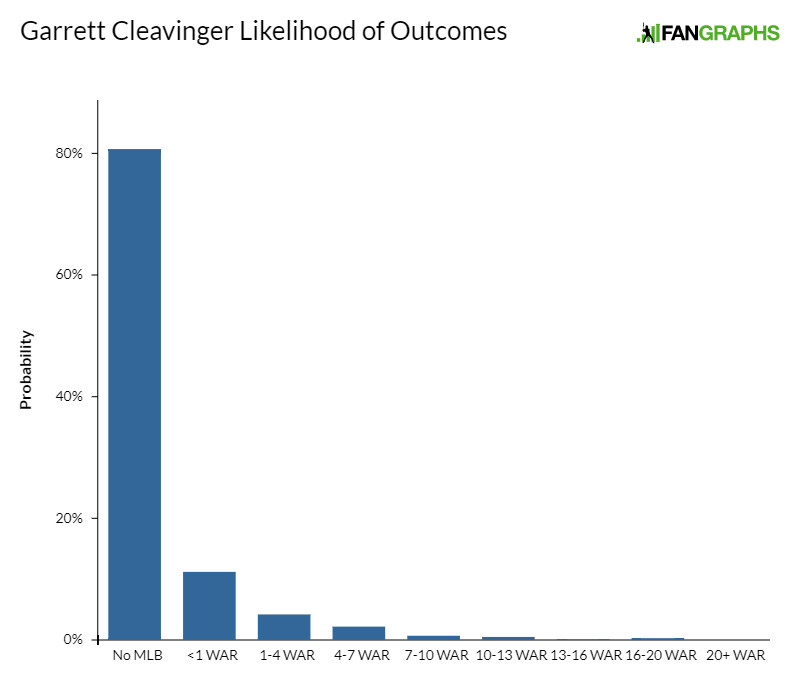 Cleavinger has been plagued by double-digit walk rates as a professional, and his strikeout rate ticked down to 23% this year. Unsurprisingly, the outlook isn’t great for a 23-year-old reliever struggling in Double-A. The second piece in the A.J. Ramos trade, Cespedes a centerfielder who’s barely hit at all in the lowest rungs of the minors. He’s hit .296 between this year and last, but it’s been a very empty .296. Cespedes rarely walks, hasn’t hit for a lick of power as a professional and doesn’t particularly make a lot of contact. 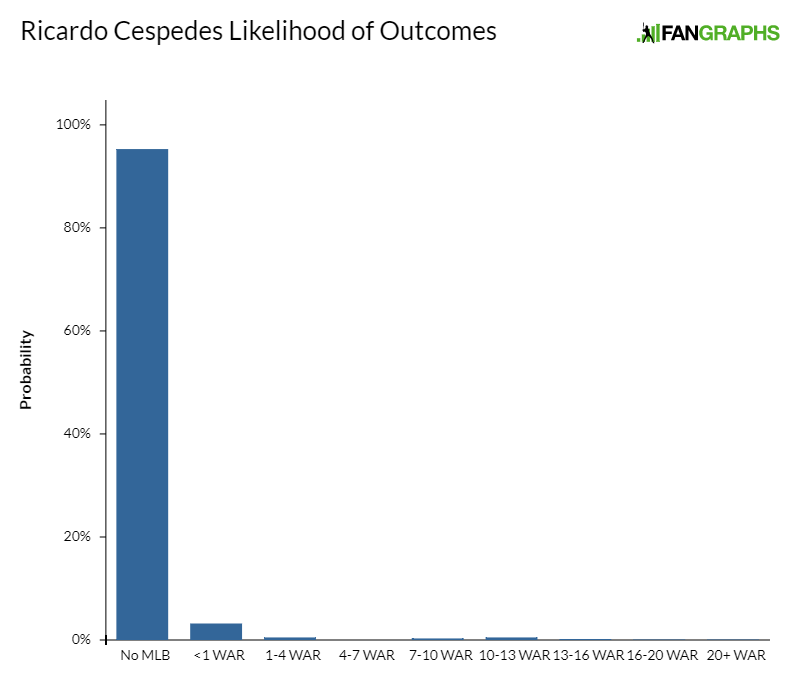 Eric gave Cespedes average-ish tools across the board, so he’s shown some promise beyond his numbers, but he still has a long way to go. We hoped you liked reading Projecting the Prospects Traded on Friday Night by Chris Mitchell! Hey Chris any projections for the prospects received in the Pat Neshek trade? Did I miss them? Thanks.